The group has a vast experience in the Shipping Industry with interest in Ship Recycling, Cash Buying, Chartering and Ship Owning. 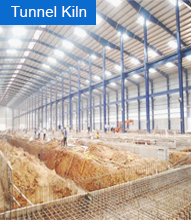 We have associations with experts in Crew, Technical and Commercial Management. Ship Recycling : This industry has been around for the last 100 years. Countries like India, China, Bangladesh and Pakistan have been most active in the Ship Breaking Industry. Prior to 1976 the import of vessels was not permitted in India. It is only in 1976 when the import of vessels was opened, which was canalized through ‘Metal Scrap Trade Corporation’.Importers were not allowed to import directly. It is only after 1982 that direct import was permitted. It was then that Alang, a coastal area located in the state of Gujarat was considered suitable because of its high tides and long stretch of beach. Today Alang is known internationally and is considered one of the largest Ship Breaking yards in the world having 270 plots. 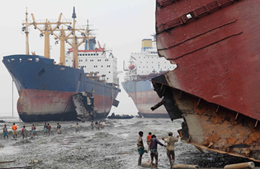 Alang Ship Breaking Yard demolishes approx 2.5 million tons of vessels each year. Pioneers in the Ship Breaking Industry, we have demolished in excess of 500 vessels with a total tonnage of approx 5 million MT. 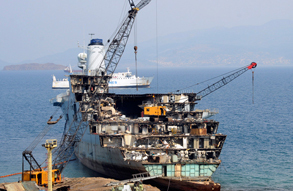 Vessels demolished include General Cargo, Containers, Oil Tankers, Fish carriers, Passengers, Ro-Ro, Naval, Aircraft Carriers, etc. Our ship breaking activities are carried out in Alang and Mumbai. Cash Buying : Cash Buying is all about purchasing securities and commodities outright, rather than arranging some type of financing as part of the acquisition. This terminology became common for business dealing in the trading of vessels for demolition and hence the business of buying and selling vessels got the name Cash Buying. We have been operating as Cash Buyers since 2004 and have dealt with more than100 vessels totaling approx 1 million MT. Chartering & Ship Owning : Considering our business activities in Demolition and Trading of vessels, diversifying into Ship Owning was a perfect synergy. Our first vessel Dawn Meerut was purchased in 2012 and has been successfully operating with Indian oil majors. Since then we have acquired two more vessels and operate them on both Indian and Foreign Waters. The Group endeavors to expand its presence in Shipping, both on Indian and Foreign Waters and expanding its fleet of vessel in the near future. The Company caters to a wide spectrum of services to 12+ principals worldwide. The group under the dynamic leadership of Mr. Gautam Daniel Chopra, a Master Mariner has made multifold growth in the sphere of Integrated Ship Management having a joint venture with Thome Shipping India Pvt. Ltd., a company recognized as one of the worlds leading integrated shipping service providers.